Morf (Jake Gyllenhaal) is one of those pretentious art critics who can tell if he’s going to love a piece of work in the first ten seconds of looking at it. Call it stupid, but the art-world has taken notice and gives him the benefit of the doubt just about every time, allowing his opinion to sway people closer to these art-collectors’ shows and therefore, making everyone richer in the process. One such collector is Rhodora Haze (Rene Russo), a former punk-gal from the 70’s who has now taken herself into the dark, seedy and back-stabbing world of art and aligns herself with Morf on just about everything he does and says. Then, there’s Josephina (Zawe Ashton), Rhodora’s assistant who stumbles upon a bunch of fantastic paintings that her dead neighbor has and decides to use them for the next art show. The works are a hit and suddenly, the most esteemed and respected people want them, but at what cost? Love in a gallery. So typical. Velvet Buzzsaw is a very strange movie, but it’s not necessarily strange in the way that Nightcrawler was. While the latter was no doubt a weird movie, it was weird in the sense that its lead-character was off-kilter and strange, but in a very humanistic, understated way that made it all seem believable; the former is no doubt an over-the-top, silly, and wacky satire that doesn’t seem to take itself too incredibly seriously. Writer/director Dan Gilroy seems to have a great understanding of this art world, how it works, the alliances, and why these people matter, as well as delivering some lovely little jabs at these types, which makes it all interesting, even if we’re never too sure what to make of it. And then, stuff happens and it’s made clear that this is a very different movie from what we originally expected. To say things take a turn for the even stranger after the first 20-minutes, would be an understatement – things get exceptionally bonkers. But as per usual, without saying too much, just know this: Velvet Buzzsaw is worth watching and paying attention to, if only because you’re never quite sure what it is or where it may be going. Gilroy seems to have followed the rather complicated mess that was Roman J. Israel, Esq., with something that’s still a little messy, story-wise, but tonally, on-point. It’s dark, it’s eerie, it’s sinister, and most of all, it’s a little funny, which is all it needs to be to be something worth watching on Netflix. Hey, look! Two people who were robbed of Oscar-nominations for playing two memorably crazy characters! It also helps that Gilroy assembles a great cast, most of whom are unfortunately left with little to do. The likes of Toni Collette, John Malkovich, Tom Sturridge, Billy Magnussen, Daveed Diggs, and Natalia Dyer, don’t have a whole lot to do, except show up and bring a little something, but really, their characters are all one-note and not really meant to be invested in. As for Gyllenhaal, Russo, and Ashton, their characters are worth taking the time to know and understand, especially Gyllenhaal’s Morf who seems to be his weirdest persona yet, even if he’s surprisingly tamer than you’d expect. Still, everyone’s game for this weird and wacky world of Velvet Buzzsaw, which makes it all the better and easier to fall in line. That’s if you can keep up with just where the hell it goes. 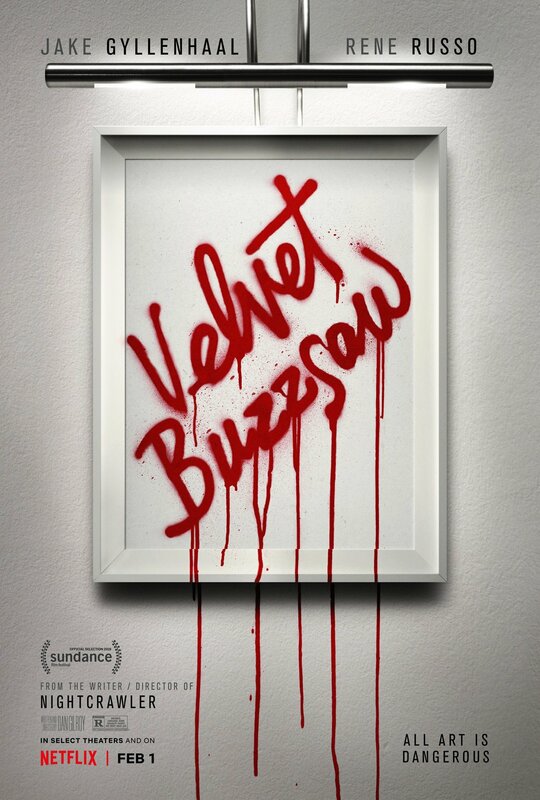 Consensus: No doubt a very strange movie, Velvet Buzzsaw is also an enjoyably weird and wacky one that feels like a different step, but also the right one for Dan Gilroy’s already very interesting career. Great review. Looks like we both thought about the same thing for it!